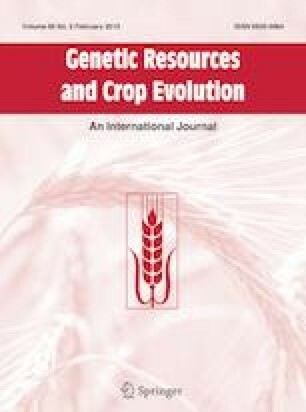 Genetic variations including agronomic traits have been studied among landraces of Citrus depressa Hayata (common name, Shiikuwasha). In order to study nuclear variations, five SSR markers were developed with contigs created by de novo assembly of reads obtained by next generation sequencing. Genetic variations were high enough to allow identification of landraces. Chloroplast insertion/deletion (cpINDEL) markers were also developed through re-sequencing of whole chloroplast genome sequences of one wild accession, Oku. Four major maternal lineages were detected using this cpINDEL analysis. Maternal diversity was confirmed with SNPs extracted from whole cp sequences of three other Shiikuwasha landraces. A later-maturity landrace, MM2, had a cp genome distinct from the other Shiikuwasha landraces, being more similar to that of sweet orange. These nucleotide polymorphisms were applied to identify relationships among the local landraces Ishikata, Shima-kabuchi, Rokugatsu, Yukunibu, and Unzoki, which are all morphologically similar but differ from Shiikuwasha in size. Ishikata and Shima-kabuchi showed high similarity for all DNA markers; they had identical whole cp genome sequences and differed in two SNPs from MM2. Yukunib and Unzoki shared identical genotypes, which differed from those of Rokugatsu and Shiikuwasha. The online version of this article ( https://doi.org/10.1007/s10722-018-0710-x) contains supplementary material, which is available to authorized users. We thank the local coordinators and farmers on Yoron and Okinawa islands. Many Ishikata accessions were donated by the townspeople of Yoron island. Accessions of local superior landraces in Oku Ward were kindly donated by local farmers, including Takahisa Shimada, Masaru Miyagi, Masakazu Shinjo, Eisho Sakihara and others. Shima-kabuchi, Yukunibu, Unzoki, and Rokougatsu were propagated by Takeshi Miyagi in Ogimi village. Other villagers in Kunigami and Ogimi also helped in this research, which was partly funded by the Churajima Foundation.